This handmade piece was donated to Fire and Ice by Lisa Michele Products who “offers handmade silver jewelry and personalized gift ideas meant to inspire joy through conscious and intentional living. My intent is to create personalized silver jewelry and other products that speak to one’s soul, which help nurture and remind people of what matters in life by identifying and living by their values. 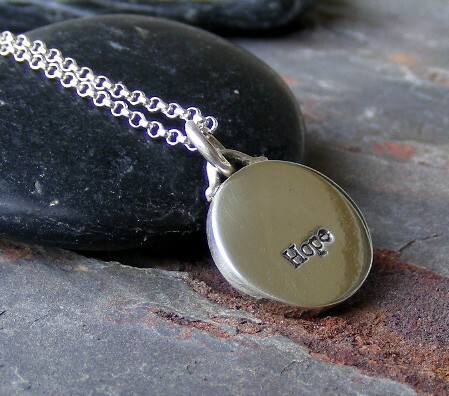 Whether it’s a hand stamped piece of jewelry with an inspirational word or quote, a Harmony Bowl or other creations, my products are meant to evoke joy and harmony in one’s life. I individually design each piece of jewelry. I have been designing and selling jewelry locally for five years. I have sold my work to local retail stores, a gallery and at community events. I continually work on developing my skills by attending classes at bead shops and an area metal design studio. Insisting on attention to detail and craftsmanship, customers can feel confident knowing they are purchasing a quality product that will last for years to come. awesome necklace! i really really like it! Follow on twitter (@JulieHeartBooks) and on here. And I follow Myra. Beautiful! I love simple necklaces like this. +1 I follow you on Twitter as @laceescapades. +1 Facebook follower as Kieran B. This is a stunningly beautiful necklace. Please enter me to win this one and thank you. Always so much cute jewelry! I am a GFC follower. Thanks for the giveaway. +1 Added LisaMicheleProducts to my favorites on Etsy (SweepstakeLover). I tried liking the first facebook link but the page would not show up. 🙁 I’m not sure why. Oh, this necklace is wonderful. We all need Hope! Thanks for the giveaway! What a beautiful piece! Good luck, all! I think this is also beautiful. I love it. What a darling necklace, even without reading the book (Which I haven’t). I love this necklace. Thank you for showcasing such a great jewelry site on Etsy!!! +1 I really like this necklace…simple and sweet. +1 I’m a facebook fan of Lisa Michele Products – Lorrie R.
Love the necklace. Please enter me. Thanks for the chance to win it. This necklace is adorable. Thanks for the giveaway. Can’t wait to read Hourglass! Love the necklace. The Joy one on Etsy is darling too! I love the simplicity of the necklace! Thanks for the giveaway! Please enter me. That pendant is so optimistic. Gotta wear it! I love the book themed jewelery! Such a beautiful necklace. Enter me to win please. +1 I am now a fan of Lisa Michele via Facebook under: Nicole O. +1 I currently like Fire & Ice via Facebook under: Nicole O. What a beauty of a piece. I love it. I haven’t read this yet but I’m excited for it! What the amazing vintage coin necklace! Please enter me in! +3 for following here, on twitter, and Facebook. Here is a tweet for the day.